This research was aimed to find out the effectiveness of blended learning on LMS with inquiry learning mode to students concept mastery. The research sample used was 68 students of Senior High School in Bandarlampung. In experimental class, the researcher used blended learning based on LMS with inquiry learning mode, while in control class the researcher used conventional mode. The research design used was Pretest-Posttest Control Group Design. After all data were collected, the data were tested for normallity, homogeneity, and ancova. Based on the result of ANCOVA with Fcount > Ftable (15,45 > 3,98), it shows that there is the difference in the average of students concept mastery in experimental class and control class which means that blended learning based on LMS with inquiry learning mode gives a significant impact to the student concept mastery. In addition, it can effectively enhance the student concept mastery proven by the difference of N-Gain average in experimental class which is 0,84 with the high category and in control class 0,70 with the average category. Azizah, S, R., Suyatna, A., & Wahyudi, I. (2017). Pengaruh Penggunaan E-Learning dengan Schoology terhadap Hasil Belajar Siswa. 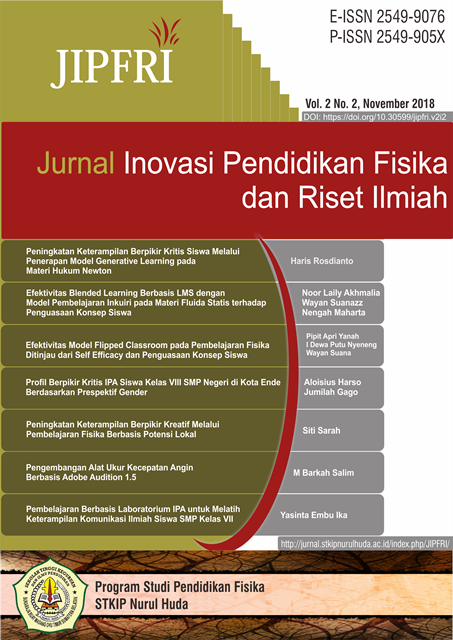 Jurnal Pembelajaran Fisika, 5 (2), 127-138. Azizmalayeri, K., Jafari, E. M., Sharif, M., Asgari, M., & Omidi, M. (2012). The impact of guided inquiry methods of teaching on the critical thinking of high school students. Journal of education and Practice, 3(10), 42-48. Awodeyi, A. F., Akpan, E. T., & Udo, I. J. (2014). Enhancing teaching and learning of mathematics: Adoption of blended learning pedagogy in University of Uyo. International Journal of Science and Research, 3(11), 40-45. Bawaneh, S. S. (2011). The effects of blended learning approach on students’ performance: Evidence from a computerized accounting course. Interdisciplinary Journal of Research in Business, 1(4), 43-50. Bulan, S. N., Maharta, N., & Ertikanto, C. (2015). Pengaruh Kemampuan Inkuiri terhadap Hasil Belajar Fisika Berbantuan Virtual Laboratory. Jurnal Pembe-lajaran Fisika. 3 (3): 109-122. Ergul, R., Simsek, Y., Calis, S., Ozdilek, Z., Gomcmencelebi, S. & Sanli, M. (2011). The Effect of Inquiry Based Science Teaching on Elementary School Students’ Science Process Skills and Science Attitude. Bulgarian Journal of Science and Education Policy (BJSEP). 5 (1): 48-68. Frydenberg, M. E., Andone, D. (2011). Learning for 21st Century Skills. IEEE’s International Conference on Information Society, London, 27-29 June 2011, 314-318. Hasanah, N., Suyanto, E., & Suana, W. (2016). E-Learning dengana Schoology Sebagai Suplemen Pembeajaran Fisika Materi Elastisitas dan Hukum Hooke. Jurnal Pembelajaran Fisika. 4(2): 71-81. Hermawanto., Kusairi, S., & Wartono. (2013). Pengaruh Blended Learning terhadap Penguasaan Konsep dan Penalaran Fisika Peserta Didik Kelas X. Jurnal Pendidikan Fisika Indonesia. 9(1): 67-76. King, S. E., & Arnold, K. C. (2012). Blended learning environments in higher education: A case study of how professors make it happen. Mid-Western Educational Researcher, 25(1/2): 44-59. Lynch, R. & Dembo, M. (2004). The Relationship between Self Regulation and Online Learning in a Blended Learning Context. International Review of Research in Open and Distance Learning, (online), 5 (2): 1- 16, http://www.irrodl.org/index.php/irrodl/article/view/189/799), diakses tanggal 6 Januari 2012. Mahnegar, F. (2012). Learning Management System. International Journal of Business and Social Science. 3 (12): 144-150. Novitayati, R. (2013). Pengaruh Metode Blended Learning dan Self Regulated Learning Terhadap Hasil Belajar Kognitif IPS. Jurnal Penelitian Kependidikan, (1), 48-57. Putri, N. W. M. A., Jampel, I. N., & Suartama, I. K. (2014). Pengembangan E-learning berbasis schoology pada mata pelajaran IPA kelas VIII SMP Negeri 1 Seririt. Jurnal Edutech. 2 (1): 1-11. Rabacal, J. S. (2018). Blended Learning: Unveiling its Potential in One ASEAN Classroom Setting. Asia Pacific Journal of Multidisciplinary Research. 6 (3): 91-95. Sutisna, A. (2016). Pengembangan Model Pembelajaran Blended Learning pada Pendidikan Kesetaraan Program Paket C dalam Meningkatkan Kemandirian Belajar. Jurnal Teknologi Pendidikan, 18(3), 156-168. Trilling, Bernie & Fadel, Charles. (2009). 21st Century Skills: Learning for Life in Our Times. New jersey: John Wiley & Sons.